Here in the U.S., today is Memorial Day, a day to remember all those who have died, but especially those who have died in service to our country. 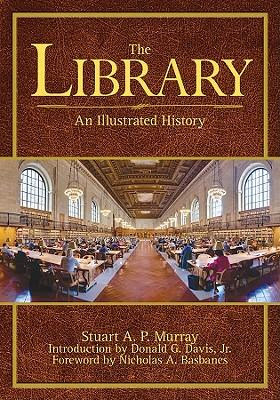 Book Review: "The Library: An Illustrated History"
Book Review: "Will I See My Dog in Heaven?" I think that everyone who has ever loved an animal has wondered whether we will see them again in heaven. The traditional Catholic answer has always been "No" because animals don't have free will like we do. Therefore, they can't choose to love God and have no part in the beatific vision that awaits us after death. While Franciscan Friar Jack Wintz acknowledges that no one knows for sure whether animals will share heaven with us, in "Will I See My Dog in Heaven?" he makes a strong case that they will indeed share in the glory to come. Wintz relies on Scripture and the witness of the saints to support his position. As a Franciscan, he takes St. Francis' position that animals are our brothers and sisters seriously. Not only does Wintz focus on the question of whether our beloved pets will be in heaven, but also on the broader issue of "Does God intend the whole created world to share in God's saving plan?" Believing that God intends heaven to be a new Garden of Eden (and that scripture expresses this), Wintz' answer is an unequivocal "yes." After all, God cares for all of his creation, not just the humans. In the Biblical telling of "Noah and the Ark," God makes sure that all the animals are saved. The covenant symbolized by the rainbow is made not only with humans, but with all the other living creatures (Gen 9:8-10). In the tale of Jonah and the city of Ninevah, the animals fasted along with the people. All were required to turn from their evil ways. In Psalm 148, all of creation gives God praise. These are just some of the pieces of evidence Wintz offers. His arguement is well-thought out and compelling. No one knows for certain what heaven will look like, but Wintz does make a strong case that we will see our faithful four-legged friends and all of the animals in the kingdom to come. I very much hope that he is right! 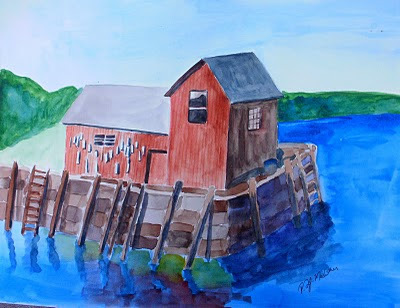 Latest Artwork - "Rockport Memories"
This watercolor took much longer to paint than most of my others. The little rocks took a while to paint! I really like how it came out, however. It was painted from a photograph I took in Rockport, MA last summer. To purchase this painting, visit Ebay Bidding starts at only 99 cents! 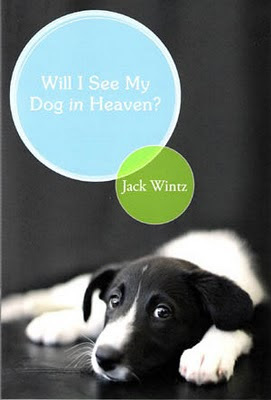 I recently read Will I See My Dog In Heaven by Jack Wintz, OFM (review to come soon). For today, I am sharing a poem he wrote as a young man. As an artist/writer, I sometimes struggle with the purpose of it all. This was a good reminder for me. and gaily carved a tray. on a fresh and dazzling thrush. for making fox and rabbit?" Who are our Newest Priests? Local parish St. Mary's of Westfield, MA has started a YouTube channel featuring Gospel readings and homilies as well as other worthwhile topics in order to reach out to the wider world of Catholics. Today was the last day for my two classes at our Catholic home-school co-op. I was teaching two art/history classes, one for grades K - 6; the second for grades 7-12. I used the Picturing America series - a collection of 40 large, beautiful artworks as the foundation of the class. I would then supplement with historical information about the time period and an art project. This class was definitely a new experience for me, but it was one I really embraced. The kids were great and I love both art and history so I was enthusiastic about the material and enjoyed the prep work and research each week. For their last homework assignment, I had the older kids write about what picture they liked most, which they liked least, and what project we had done over the course of the year they enjoyed the most. I read their responses this afternoon. While some of them may have been just doing the assignment because they had to, I got the sense that almost everyone had something to take away from the class, something that hopefully they will remember for a while. I had always wanted to teach a class like this, integrating art and history, and I am so thrilled that I got a chance to do it. My life looks nothing like I imagined it would when I was a teenager. Yet, in vastly different ways, God has allowed many of my dreams to come true. They just come true in His time and the way He sees fit. If only I would learn to trust that process instead of complaining! I love this statue from our recent cemetery trip. I wanted to share it with you. I've always enjoyed cemeteries. I find them peaceful places. As a child, my parents would take me as they dutifully brought flowers to the family gravesites. I would explore the nearby graves with interest. Who were all these people? What were there lives like? As a teenager, my father taught me to drive in a cemetery. As a young adult, one of my best friends lived right next to a cemetery. We spent many enjoyable evenings walking the grounds. I'm trying to share my love of cemeteries with my children. As we searched the graves, I made a point of praying for the souls of the people whose remains laid beneath the ground. Many had left this world a long time ago. Who knew the last time someone had said a prayer on their behalf? But our time is not God's time, and prayers for souls are never wasted. If they are not needed by the soul for whom we are praying, they are applied to another soul in need. Just as when as I when a little girl, I still wonder about the people whose names are on those stones. A life cannot be summed up on a tombstone. Most modern stones offer little more information than a name and two dates. Older stones offer more of a tribute to a person. The one that struck me most on this particular journey was that of Mrs. Julia Hawkins Brown. She died on January 18, 1898 at the age of 74. Her epitaph reads "She Made Home Happy." What a wonderful tribute to a person! How thankful I would be if, as a wife and mother, I was remembered as making home happy, of bringing joy and peace to our domicile. Of course, there are other things I'd like to be remembered for. I'd like to be remembered for being a good Christian, for being kind to others, for being a hard worker, and for being a good writer. Yet, if I do all those things for the rest of the world, and fail in my domestic duties, I really haven't accomplished much of anything. After God, my family is my first priority. I hope that I succeed in making our home a happy one. I hope that is how my children and (hopefully) grandchildren will remember me. Maybe they will even put it on my gravestone, and some stranger will come by a hundred plus years after my death and stop and say a prayer for me and think I was a good woman. Watch the 21st National Conference on Medjugorje streaming live from the University of Notre Dame from 7:00 PM Friday, May 21 until the conference ends at 2:30 PM Sunday, May 23. A couple of weeks ago, I had the opportunity to watch "Julie and Julia." The premise of the movie is that a young woman named Julie decides to spend a year making all of the recipes in Julia Child's book Mastering the Art of French Cooking and blogging about the experience. Julie is a frustrated writer working a government job she hates while all her college mates have gone on to successful careers. This is her chance to exercise her writing muscles, and the blog eventually gains her fame, a book deal, and (ultimately!) this movie about her story. Now, the best thing I can say about my cooking is that I haven't killed anyone. I'm not a foodie, and chances are I will go through my whole life without ever cooking anything out of a Julia Child cookbook, yet I enjoyed watching Julia find her niche. She went to cooking school in Paris to find something to do and it turned into her life's work. I appreciated her determination as she worked 8 years on her cookbook. Meryl Streep did a great job playing her! What I was most interested in, however, was Julie's life as a blogger, one of us intrepid people who share our lives and thoughts with the world via this modern tool. She was doing this project in 2002 when blogging wasn't anywhere near as ubiquitous as it is now. I loved her idea of a one-year blogging project. I had done that myself in 2008 with my Moment of Beauty project. There is something about making a commitment to do something every day for a year and following through on it. The scene in the movie that most resonated with me was when she felt like no one was reading. It can be hard to be a blogger, to wonder if anyone reads what is put out there. Then slowly she began to get more and more comments until she had a whole wide community following her and got the attention of the New York Times. (Yes, by that point, I was jealous!). Yet all is not roses. Her obsession with her project does cause some issues in her personal life. 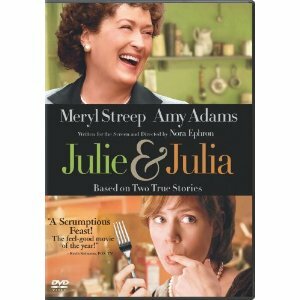 In any event, "Julie and Julia" is a great movie for anyone who loved Julia Child, loves cooking, or loves blogging. Are You a Catholic Writer? Are you a Catholic writer loyal to the Magisterium and looking for a group of like-minded writers determined to assist each other in our publishing goals? Are you an editor, publisher, or illustrator interested in furthering the development of quality faith-filled writings? If so, the Catholic Writers' Guild may be for you. The Catholic Writers' Guild is a non-profit organization comprised of writers, artists, editors, illustrators, and allies dedicated to building a vibrant Catholic literary and artistic culture. We do this by encouraging Catholic writers to create, publish, perform, and share their work; by reflecting upon core Catholic values (i.e., those in accordance with the teaching of the Magisterium) in art; and by networking within the faith and literary communities. Our organization is loyal to the teaching authority of the Church. Our regular and alumni members are practicing Catholic writers, while institutional members are persons or companies supportive of Catholic writing; institutional members need not to be Catholic, but sympathetic to Catholic practices and morals. Catholic Writers of Long Island, which is poised to become the first local chapter of the Catholic Writers' Guild, will hold a full-day conference at the Seminary of the Immaculate Conception, 440 West Neck Road, Huntington, New York, on Saturday, June 19th, 2010 from 9:30-4:30pm, entitled, "The Word Made Flesh: A Day of Encouragement and Enrichment for Catholic Writers." Signed copies of good Catholic books, theater tickets, and other valuable prizes will be raffled off and proceeds will benefit Catholic Relief Services, which is a 501[c]3 organization. All are welcome, including nursing mothers with their babies. The event's keynote speaker, Rick Hinshaw, editor of the Long Island Catholic, will receive the Catholic Writers' Guild's "Lily" award for Meritorious Achievement in Catholic Arts and Letters. Other speakers include: award-winning author and publisher, Josephine Nobisso; author and composer, Alexander J. Basile; retreat leader and host of "Among Women" podcast, Pat Gohn; and author and seminary rector, Msgr. Peter Vaccari. Msgr. Charles Fink, Director of Spiritual Formation for the seminary, will be the homilist. The event emphasizes connectedness in the Body of Christ and supports professional networking via breaks with refreshments and a special bonus; early-birds will have bios and contact information listed in ¼-page sections in the program, an added value worth $15. Mass, Rosary, and buffet lunch included. Tickets before June 1st: $25 for adult early-birds and $17 for student early-birds. From June 1st-June 15th, tickets: $35 for adults and $25 for students. Meal head-count closes June 15th. God, help me to accept my reality as a basis for continued growth. I want to stop living in the future, waiting for what is not, wishing for different circumstances and dreaming of a someday that may never be. Help me live peacefully, joyfully, intentionally NOW. Even this prayer makes me smile. Thank you, Lord. 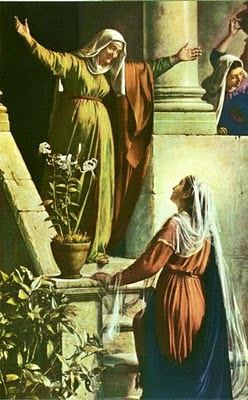 When I was growing up, my mother would often make a spiritual communion and speak of its value. I didn’t really pay much attention. It was fine for her, I reasoned. After all, it couldn’t hurt. But like many of what I considered her “pre-Vatican II” practices, I didn’t put much stock in it. With time, maturity, and education, I am beginning to realize the value of many of my mother’s prayers and devotions. In the Eucharist, "unlike any other sacrament, the mystery [of communion] is so perfect that it brings us to the heights of every good thing: Here is the ultimate goal of every human desire, because here we attain God and God joins himself to us in the most perfect union." Precisely for this reason it is good to cultivate in our hearts a constant desire for the sacrament of the Eucharist. This was the origin of the practice of "spiritual communion," which has happily been established in the Church for centuries and recommended by saints who were masters of the spiritual life. St. Teresa of Jesus wrote: "When you do not receive communion and you do not attend Mass, you can make a spiritual communion, which is a most beneficial practice; by it the love of God will be greatly impressed on you" [The Way of Perfection, Ch. 35.]. A spiritual Communion can be of value to anyone who desires a deeper union with Christ. It can be made at any time of the day or night. It is especially appropriate for those who find themselves unable to physically receive the Eucharist. For example, those who are not yet Catholic, those who have been away from the Church for a long time and who have not yet made a good confession, those who are living in a state of serious sin, as well as those who are sick or housebound. How does one make a spiritual Communion? Simply by desiring it. One formal prayer is “O Jesus, I turn toward the holy tabernacle where you live hidden for love of me. I love you, O my God. I cannot receive you in Holy Communion. Come nevertheless and visit me with your grace. Come spiritually into my heart. Purify it. Sanctify it. Render it like unto your own.” One need not use a formal prayer, however. A simple “Lord Jesus. Come into my heart” is sufficient, as is imagining Jesus coming into one’s heart. As with any other spiritual habit, the more one does it, the easier it will become. There is no limit to the number of times we can ask Jesus to meet us. He desires to be with us. I'm sure at some point in my religious upbringing and education, someone pointed out to me that the original novena (nine days of prayer) took place in the time between the Ascension and Pentecost. Yet, when I read that piece of information yesterday it came as news to me! (There is no accounting for the things I have forgotten in my life!) Interestingly enough, I found that piece of information after I had already made the decision to start a new rosary novena Thursday morning. I save Rosary Novenas for the truly big needs in my life. 54 days (3 novenas of petition and 3 novenas of thanksgiving) requires a certain amount of commitment. At the same time, it always gives me peace, acceptance, strength, and in God's good time, an answer. This time, I'm actually saying it for someone else, a dear friend who could use some help. I don't know what answers the prayers will lead to, but I am trusting in God's wisdom and love. I admit it. I don't think about the Eucharist as much as I should. I value it immensely, and know the strength it gives, but I do tend to take it for granted sometimes. 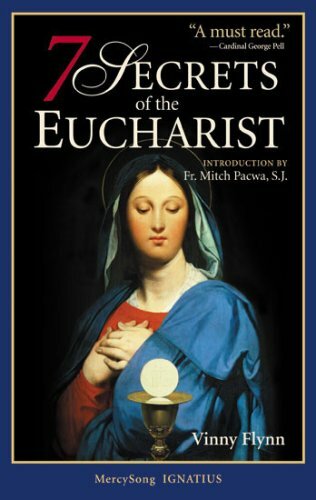 Vinny Flynn's "7 Secrets of the Eucharist" helps readers to once again be amazed by the mystery of the Eucharist. While no one can fully understand the Eucharist, Flynn uses Scripture, The Catechism of the Catholic Church, certain Church documents, and the Diary of St. Faustina to help explain it as much as possible. St. Faustina, best known for her role in spreading devotion to Divine Mercy, was also deeply dedicated to the Eucharist and refers to it often in her writings. Flynn is adamant that there are far more than seven secrets of the Eucharist. Also, these aren't really secrets. As he puts it, "I call them secrets because, for some reason, they don't seem to have been passed on to the average lay person in a way that would enable us to really understand them and incorporate them into our daily lives." The secrets are 1) The Eucharist is Alive, 2) Christ is not alone, 3) There is only one Mass, 4) The Eucharist is not just one miracle, 5)We don't just receive, 6) Every reception is different, and 7) There's no limit to the number of times we can receive (for those of you who are saying "yes, there is!" he is talking about spiritual communion in this section). "7 Secrets of the Eucharist" is a very valuable little book. The Eucharist is the greatest gift Jesus gave us - his very self. This book provides complex information about this sacrament in a highly readable format. More importantly, it will increase belief and devotion to the Eucharist. Thank you to the reader who purchased the digital camera and accessories through my Amazon link! I greatly appreciate the support. Thanks to all of you who purchase anything through the Amazon link or who take the time to visit any of my advertisers. Every little bit helps! Some great quotes from "Go in Peace"
Here are a few great quotes from >Go in Peace: Your Guide to the Purpose and Power of Confession by Fr. Mitch Pacwa, S.J. and Sean Brown. When we go to confession, we are like Bob Dylan, 'Knock, knock, knockin' on heaven's door.' By dying for our sins, Jesus unlocked the door to forgiveness and to heaven. Without his saving death, we could plead and wail at the door forever, but we would remain shut out eternally in our own darkness, unable to open the door even a crack, However, the fact that Christ has opened the door does not mean that we have already walked through it to salvation. We must still do our part, going to the door by confessing our sins, asking Christ's pardon, and accepting the reconciliation He offers. A person who despairs of forgiveness sins against the Holy Spirit because he is convinced that 'My sin is so bad, God could never forgive me.' The essence of such a sin is an overweening pride that claims to have the power to commit a sin so great that even God could not forgive it; it is a disbelief in the mercy of God. Many people struggle with habitual sins, the most common being in the areas of sexuality, eating, gambling, compulsive shopping, and gossip, among others. While they may strive with all their might to overcome a particular habit, they may still fail on occasion. Every time they fail, such people should seek reconciliation by going to confession. They should not become discouraged (as discouragement is always from the devil) but should have faith that Christ's grace in the sacrament will, in time, help them change bad habits into good habits. Just a reminder, in many U.S. Dioceses (including my own) tomorrow is a Holy Day of Obligation. The Feast of the Ascension recalls how Jesus returned to heaven after being physically present to his Apostles for 40 days after the Resurrection. He promised to send his Paraclete (the Holy Spirit), which will happen on the feast of Pentecost which we celebrate 10 days from now. "1) 'They lived happily ever after' is a line in a fairytale. (And if a fairytale ever had a sequel, that would be the end of that nonsense). 3) While a problem may be new to you, you probably aren't the first one to face it. Get help from professionals, from family and friends, from the parish or diocese, from the amazing variety of trusted resources available these days. 4) Truth be told, you're probably going to make a mistake or two along the way. But to quote St. Francis de Sales, 'Be patient with everyone, but above all with yourself . . . Do not be disheartened by your imperfections, but always rise up with fresh courage.'" If there is one area of Catholicism that causes more confusion than any other, it is the Sacrament of Reconciliation (also known as confession). In "Go in Peace: Your Guide to the Purpose and Power of Confession," Fr. Mitch Pacwa, S.J. and Sean Brown do an admirable job of explaining this sacrament. In a straight-forward question and answer format, they provide concise explanations of 101 aspects of sin, confession, heaven, hell, purgatory, and indulgences. 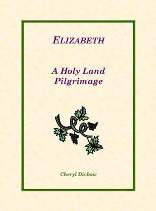 Non-Catholics who wish to understand more about Catholicism will gain much information from this book. Catholics who struggle with the Sacrament of Reconciliation will find more reason to appreciate its value and the need for it. Catholics who regularly take advantage of the sacrament will still learn from "Go in Peace." The section on indulgences is particularly well-written and does much to clear up misunderstandings regarding this practice. 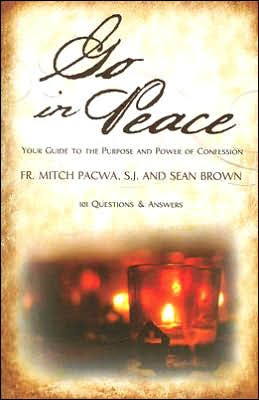 "Go in Peace" also features a helpful Examination of Conscience at the end of the book to help people review the state of their soul prior to going to confession. Beth Wiseman takes her readers on an enjoyable sojourn back to Lancaster County in "Plain Paradise." The next installment of the "Daughters of the Promise" series lives up to the high standards set by the previous books. Each one in the series features a woman who comes in contact with the Amish community and rediscovers her own faith as a result. Seventeen years ago, Josie's parents forced her to give her daughter up for adoption to an Amish family. Now, faced with a life-threatening illness, her final wish is to reconnect with her long-lost daughter. Linda has never been told she is adopted. Needless to say, the shock is considerable. As she learns more about her mother and her life, she has to make some important decisions about who she is and what matters to her. Her adoptive mother is forced to look inside her heart as well. This is a great story with elements of romance, medical drama, and faith. 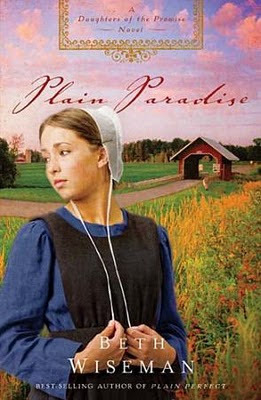 Anyone who enjoys the "Amish novel" genre will relish their quality time with this story, whether or not she has read the others in the series. For fans of the series, this is a must-read. I just got my latest Bible study book (a friend of mine was kind enough to order and pick them up for all of us at a local Catholic store). Just flipping through it, I can tell it's another book that is going to cause me pain. I go to my weekly Bible Study because I like the women there and because it gives my children an opportunity to play with their friends. When I started homeschooling, I knew I didn't want to homeschool alone. I wanted to have a community to do it with, and I am so very thankful to have these women in my life. They are all great people. That being said, these Bible Study books and the conversations that surround them seem set up to make me feel inadequate. I consider my two hours at Bible Study to be my exercise in humility for the week. I'm a quiet person by nature, so mostly I just sit and listen. A lot of times, I just want to go home and cry. I guess it is just me, because the other women all love these books. My life certainly doesn't measure up to the standard extolled in these books, nor will it ever. I've come to accept the imperfect version of myself, that I am a work in progress that will never be complete. It's taken me a long time to come to that acceptance, to let go of the need to be perfect in every way. I'm sure I will pick up a tidbit or two out of this book. There will probably be a couple blog posts that will come out of it. Mostly, though, I am just trying to prepare myself for all the negative feelings that will come my way from reading it. Does anyone else out there feel like they are being held to a standard they can't possibly meet? How do you deal with it? "It was his mission to celebrate the ordinary - 'the things we have seen all our lives, and overlooked.'" That's the secret of happiness right there - to celebrate and cherish the everyday, to pay attention to the small things. God has given us a beautiful world full of beautiful moments. Take the time to appreciate them.